With Black Friday and Cyber Week behind us, you undoubtedly have a bunch of new gadgets that are in desperate need of digital storage. And with Christmas still a head of us, you might soon receive several more. Lucky for you, Amazon has a killer sale going right now that drops the price of the Samsung 128GB 100MB/s (U3) MicroSD EVO Select Memory Card with Adapter all the way down to just $36.99. Hurry though, because this deal is definitely going to sell out. Prefer SanDisk? 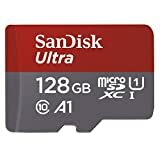 Amazon has a less impressive sale going on SanDisk 128GB microSD cards, but they’re just a few dollars more than the Samsung model at $43.